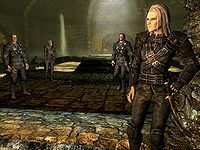 Later on in the quest, Brynjolf will task you with breaking into Mercer's house, Riftweald Manor, to try and learn where Mercer has gone. 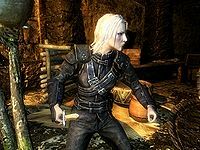 When he provides you with this task, Brynjolf will mention that Mercer has hired someone to guard the house. If you ask him to elaborate on the watchdog, he will say, "That'd be Vald. A real piece of work, that one. Mercer's holding something over his head, keeping him loyal." 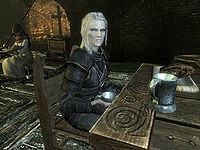 He will then continue on, mentioning that Vex has a personal connection to Vald: "Talk to Vex. She used to know him very well... if you catch my meaning." 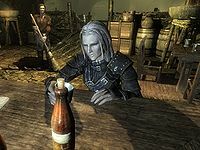 Once you have finished your conversation with Brynjolf, you can then talk to Vex and tell her that Brynjolf says she has a connection with Vald. After hearing the name of her former lover, she will reply in disgust: "That pig? Oh, I have info on him. More than you care to know." Mentioning to her that you want to get on his good side will have her then snidely remark, "Vald? Good side? I think you have the wrong person. The only thing Vald understands is gold. A man after my own heart." 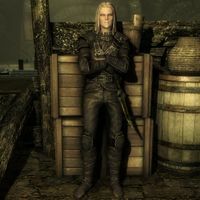 After hearing this, you can then ask Vex if you should try to buy him off. She will suggest that you can try to, but it may be harder than you would expect: "Sure, but he'll ask for a whole lot. I mean, you are asking him to betray Mercer Frey. Your best bet would be to erase his debt with Maven Black-Briar. If you talk to her, she might be able to give you the details." 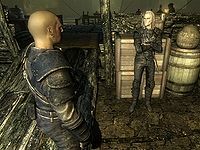 She will then finish by revealing that she is indifferent about what happens to Mercer's watchdog and her former lover: "Of course, you could just run him through and take what you need off of his corpse... I could care less." Reduced to low health "Enough damn it!" This page was last modified on 23 October 2018, at 10:37.